Sour cream & serenade chilli seasoned potato crisps. No artificial ingredients. Free from gluten. Suitable for vegetarians. 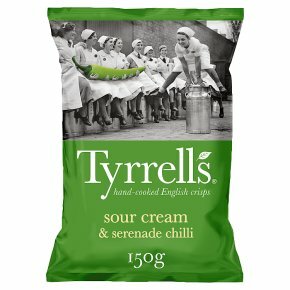 The tantalising tingle of English serenade chilli tempered by the mellow twang of sour cream. They're made with the finest local potatoes, complete with jackets, hand-cooked in small batches & spun to achieve our signature crunch.